The Patriot is a solid-frame revolver and as such doesn't have a removable sideplate, a design that provides additional strength. In recent years, several revolver manufacturers have introduced revolvers for the relatively new .327 Federal Magnum, the newest being Charter Arms, which has not one but three offerings in this chambering: the 2.2-inch Patriot, the Crimson Patriot (with Crimson Trace laser grips) and the four-inch Target Patriot. I chose to review the standard Patriot. The Patriot is a solid-frame revolver and as such doesn't have a removable sideplate, a design that provides additional strength. It is constructed completely of stainless steel, and the 2.2-inch barrel features a full-length underlug that not only protects the ejector rod from damage but also dampens recoil. The one-piece barrel/lug/sight assembly is threaded directly into the frame for rigidity and strength. The front sight features a high, ramped blade, and the groove on the frame topstrap that serves as a rear sight is generously sized and squared off. When combined, they give a fast, clear sight picture, which can't be said about some snubbies on the market. The stainless steel cylinder features a three-point lockup: a wide, spring-loaded collar on the ejector rod engages the front of the frame; a stud on the rear of the ejector rod locks into the recoil shield; and the cylinder stop positions and holds the cylinder in place. The system works. Unlike some revolvers I've handled, when the cylinder on this Patriot was locked up, there was no discernible wiggle. Because of the relatively small diameter of the .327 Federal Magnum cartridge, the Patriot's cylinder holds six rounds instead of just five. Pushing forward on the cylinder release on the left side of the frame allows the cylinder to be swung out to the left for loading or unloading. The cylinder crane is secured in the frame by means of a hefty screw inserted from the front of the frame. Pushing the ejector rod to the rear extracts all the spent cases simultaneously. The Patriot revolvers use a traditional single-action/double-action trigger mechanism. The double-action trigger pull on the Patriot I received had the typical "new gun" stiffness, but it smoothed out noticeably during our test firing. Like all Charter guns, the Patriot employs a transfer bar system for safety. While the rear sight is just a topstrap groove, it provided a good sight picture. The Patriot has robust locking system, a full underlug that helps to dampen recoil, and a cylinder that holds six rounds. As do all Charter Arms revolvers, the .327 Patriot uses a transfer-bar ignition system. When the trigger is pulled, a bar is raised in front of the firing pin that the hammer strikes to push the firing pin forward. At all other times the hammer rests on the frame, where it cannot impact the firing pin. A nice touch is that the trigger has been ergonomically designed so as not to pinch the shooter's trigger finger, a common problem those ham-fisted among us experience with some small-frame revolvers. 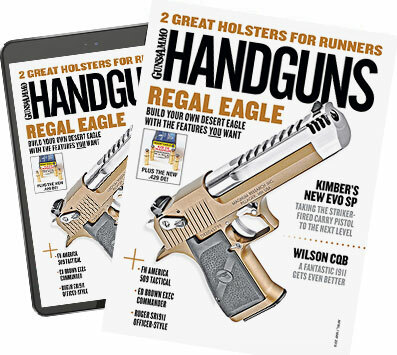 The Patriot is fitted with rubber, finger-groove grips for a firm purchase--even with wet hands or when wearing gloves--and enhanced recoil control. Butch Simpson helped me run the Patriot through its paces. Our first task was to test it for accuracy by firing it from a rest at a measured 15 yards. In addition to using two different types of .327 Federal Magnum ammunition we also fired some .32 H&R Magnum through the Patriot (any revolver chambered for the .327 Federal Magnum can safely fire .32 S&W, .32 S&W Long and .32 H&R Magnum cartridges), the results of which can be seen on the accompanying chart. While the gun printed low, it was acceptably accurate and turned in some very good groups with ammo it liked. The Patriot tended to print a bit low with all three loads, forcing me to use some "Kentucky elevation" to put rounds where I wanted them. But as can be seen in the photos, with ammo it liked--in this case, Speer 100-grain Gold Dot--it proved capable of producing some decent groups running from 11â'„2 to three inches in size. I then paced off seven yards and set up an IDPA-type combat target. Butch and I took turns running the Patriot through a series of offhand drills, firing it with both supported and unsupported (one-handed) grips. The rubber grip's tacky surface provided a very secure purchase, which made fast follow-up shots easy in addition to helping tame the somewhat snappy recoil of the .327 Magnum. Once again it tended to print a bit low, and Butch said we should've taken a file to the front sight, but once we got used to it, all of our rounds ended up in the highest scoring zone of the target. All in all, we found the Patriot to be well-suited to its intended role in life as a close-range personal defense handgun. It's rugged, reliable, acceptably accurate and easy to use--and attractively priced. What more could you ask for? WARNING: The loads shown here are safe only in the guns for which they were developed. Neither the author nor InterMedia Outdoors, Inc. assumes any liability for accidents or injury resulting from the use or misuse of this data. NOTES: Accuracy results are the averages of three, five shot groups fired from an MTM Predator rest at 15 yards. Velocities are averages of five rounds measured with a PACT chronograph 10 feet from the muzzle. Abbreviations: HP, hollowpoint; JHP, jacketed hollowpoint.